The mining scourge reaches the sacred Khandadhara. 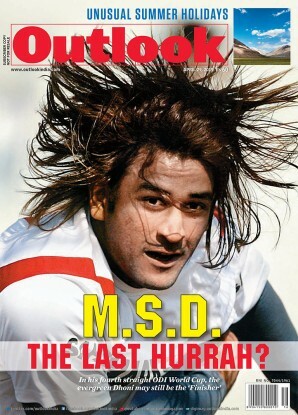 Will it turn ‘raktadhara’? A rugged, tree-covered mountain range sweeps vertically into a brilliant blue sky. Out of a cave on its western side gushes a natural spring, its lacy, white water tripping 244 metres over a sheer black-and-red cliff face to fall into a blissful rock pool, before cascading further downhill. The site is of ethereal beauty, evoking awe, elation, a sense of rejuvenation. 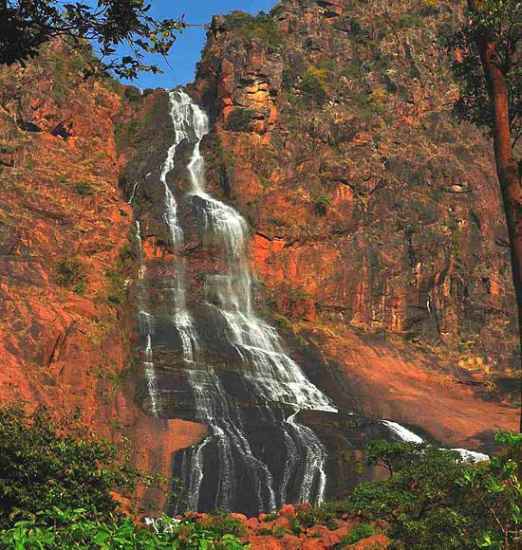 One of India’s highest and most sacred waterfalls, Khandadhara in Sundergarh, Orissa, is cherished by tens of thousands for the life it brings to all in its vicinity. “It’s because of the Khandadhara that my life flows with power,” says a Munda resident of Bandhbarna village, which lies near the foot of the mountain. Although a migrant from Jharkhand, he shares the reverence of all the indigenous peoples here—including the Christians—for the Khandadhar mountain and its waterfall. By common consent, the guardians of the range are the Pauri Bhuiya, a tribe of shifting cultivators who traditionally live in the dense sal forest that covers the peaks. Genetic research finds that about 24,000 years ago the Pauri Bhuiya shared a common ancestor with the Jarawa of the Andaman Islands—a reminder that India’s indigenous peoples directly descend from some of the first modern humans to wander the earth. The Pauri Bhuiya are also unique among Orissa’s tribals for speaking a version of Oriya, rather than an entirely different language: they claim theirs is the original Oriya. A Pauri Bhuiya legend speaks of how their mountains came to be so munificent. The Sundergarh branch of the community was once possessed by a rapacious goddess named Kankala Devi, who consumed trees, soil and everything else. In despair, the Pauri Bhuiya placed her on a rock, which she ate through as well—creating a deep hole from which poured out the Khandadhara (split-rock waterfall). So they had water. Then a couple from the community went to visit relatives at the eastern, or Keonjhar, end of the Khandadhar mountain range. Their prospective hosts were away but a pile of grains had been left outdoors and, amazingly, not even the birds were eating it. Inside the heap, the couple discovered a small goddess, Khand Kumari, protector of the region’s prosperity. They stole her and brought her back to Sundergarh, and so her bounty became theirs. 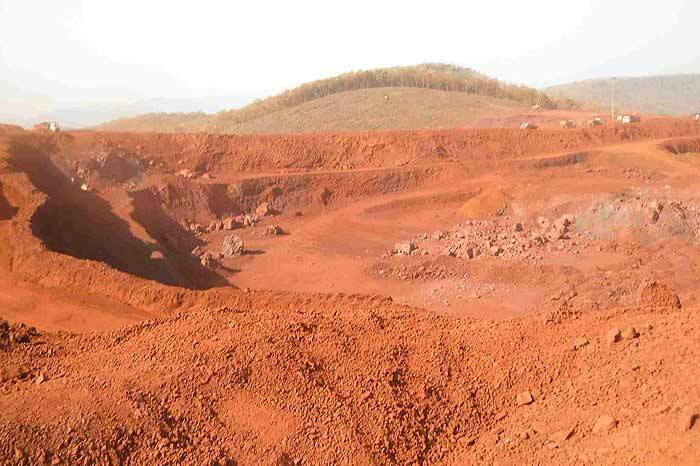 The mining firms call the Khandadhar range the “jackpot”; Orissa govt has promised Posco 2,500 ha of it. The Pauri Bhuiya never cut down a shade or fruit tree, so the mountaintop abounds with nourishment. The pristine, ancient jungles are home to elephants, sloth bears, leopards, gaur, pythons, peacocks, tigers and a rare limbless lizard—a keystone species that testifies to the richness of the ecosystem. The thick jungle absorbs monsoon rain, releasing the water in perennial streams that feed the Khandadhara. But in the ’90s, some 80 Pauri Bhuiya families were shifted by the Pauri Bhuiya Development Agency (PBDA) from the mountaintop to the plains, under the pretext that their shifting cultivation was damaging the forest. Not for long. The strikingly coloured rocks that give Khandadhara its beauty are red jasper and black hematite—both made of iron. Downstream of Khandadhara, one can pick up massive, gleaming chunks of largely pure iron. The mining companies call the Khandadhar range the “jackpot”, and at this very moment the Supreme Court is deciding which of several contending firms has the winning ticket. The Orissa government has promised the Pohang Steel Co of South Korea (Posco) as much as 2,500 hectares of Khandadhar—essentially the entire Sundergarh section of the mountain range. All the region’s tribals know what will happen if Posco comes, because they have had a foretaste. Deep inside the range, invisible from normal roads, rises a horrific sight: the blood-red carcass of Kurmitar mountain, flayed of its skin of trees and topsoil and terraced into a giant pyramid by a spiralling road for trucks laden with iron ore. Dynamite blasts have pulverised the underlying rock into a fine dust that gives the mine its brilliant red colour. Behind this Mars-scape, the partially shaved surface of another mountain rises—readied for mining by clear-cutting the trees. Dust smothers the jungle for hundreds of metres around, but in the distance one can see the undulating green of what remains, for now, of the Khandadhar reserved forest. The Kalinga Commercial Corporation Ltd (KCCL) operates the 133-hectare Kurmitar mine. It boasts on its website of having exceeded production targets by several hundred per cent, and of exporting iron ore to China and manganese ore to an unnamed Korean company. Hanuman is said to have carried on his shoulders a portion of the Himalayas in order to find a medicinal plant to save Lakshman’s life. The Samal family of Bhubaneswar, which runs kcc, could be even more powerful: it is transporting an entire mountain to China and beyond. Kurmitar was a “devisthan”, the abode of a goddess, say the Pauri Bhuiya. It was covered with dense jungle in which thrived elephants, bears and luscious kakri fruit hanging from vines. No doubt driven out by the blasting and loss of habitat, the elephants have begun emerging in the plains. A tigress appeared in January near Phuljhar, at the foot of the mountain. In April, the forest department burned down the huts and food stores of some 20 Pauri Bhuiya families who had come off the mountain and were sheltering in jungles that had been their own. Just as frightening, the destruction of the forest and the diversion of a mountaintop stream by KCCL has caused the Khandadhara waterfall to partially dry up. Its water no longer reaches the Brahmani river as it used to, and a canal that Bandhbarna’s residents used for fishing, bathing and irrigating crops has been bone-dry for two summers now. All over the region, tubewells are becoming defunct as the water table falls. Streams by Phuljhar and other villages run red with mining dirt, killing fish and polluting fields. When it rains, even the Khandadhara bleeds red, transforming into a ‘raktadhara’ that flows from the mountain’s gaping wounds. If a 133-hectare mine can cause such havoc, the devastation to be wreaked by Posco’s 2,500-hectare lease is beyond imagination. To begin with, the Khandadhara waterfall will completely dry up, depriving tens of thousands of the water of life. “The miners are demons...they not only eat the soil and trees and rock, but even the water,” says a Pauri Bhuiya woman in Phuljhar. “Kankala Devi gave us this water, these demons will consume it too. We have to get rid of them or they will eat up everything.” All around the Khandadhar range, the tribals are gearing up for a fight—not only for their own survival, but in defense of a common heritage of humankind.